Type and Characteristics - Heavy sailing frigate, one of six authorized (along with USS United States) by Congress, approved 27 March 1794, built at Edmund Hartt's Shipyard, Boston, MA, laid down 1 November 1794, launched 21 October 1797, put to sea 23 July 1798, 2,200 tons, 175ft long x 43ft 6in beam x 14ft 3in draft, 13kts, armed with 30-24pdr cannon, 16-18pdr carronades and 10-12pdr cannon, 450 crew, first commanded by Captain Samuel Nicholson. Log Period and Areas of Service - 1826-81 (some years and months missing), 1931-32, including Mediterranean Squadron, South Pacific Squadron, Home Squadron. 1828 - Returned to Boston after period as Flagship, Mediterranean Squadron. 1830 - Surveyed and found unseaworthy, set aside for sale or scrapping, but rescinded because of public pressure. 1833 - Reconstruction begun at Boston. August 1835 - Started 3-year tour as Mediterranean Squadron flagship. 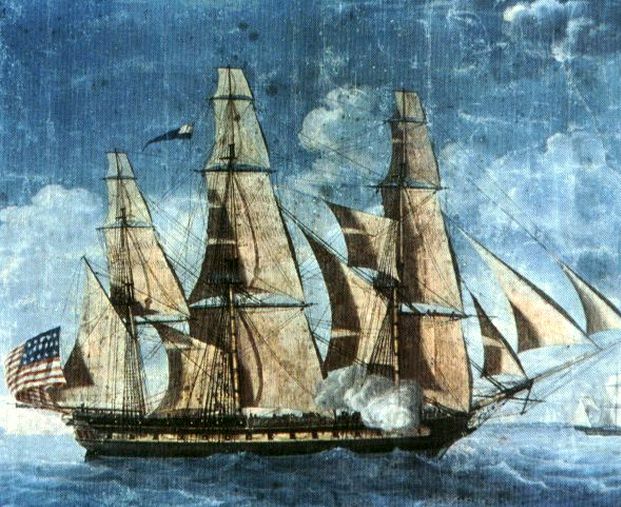 1839-41 - Flagship, South Pacific Squadron. 1842-43 - Flagship, Home Squadron. 1844-46 - Began 30-month circumnavigation. 1848-50 - Flagship, Mediterranean Squadron. 1852-1855 - West African coast anti-slavery patrols. August 1860 - Took up duties as midshipman training ship at Annapolis. 1861-65 - During Civil War, continued training duties at Newport, RI. 1871 - Decommissioned. Later started rebuild at Philadelphia. 1877 - Recommissioned to carry goods to the Paris Exposition. Then returned to training duties, cruising from West Indies to Nova Scotia. 1884 - Towed to Portsmouth, NH to serve as receiving ship. 1897 - In Boston for her Centennial year. Decommissioned. 1905 - Saved from scrapping by public demand, and partly restored as national museum. 1925 - Plans for complete renovation started. 1 July 1931 - Recommissioned. Next day, started tour of 90 US ports along the Atlantic, Pacific and Gulf coasts. May 1934 - Returned to Boston Harbor. Fate: Still in commission in Boston.